Electrician in Troy NY Archives - Page 2 of 4 - Lammon Electric LLC. Commercial electrical problems can be an inconvenience. For businesses it is important to have uninterrupted access to electrical power that has flawless operation for equipment and machines. For the majority of businesses, this is true no matter the industry or operation scale. Obviously, if a businesses’ computers and equipment are constantly having power supply issues, employees will not be able to do their job. In addition, warehouse supplies could spoil if an electrical issue occurs. For these reasons, it is critical that businesses do not wait to find help from a professional to tackle any issues that may occur. Although, there are some minor tasks that can be handled by staff, including replacing fixtures or changing out light bulbs. However, if the problem causes work to suddenly stop or potential damages are expected, it is best to contact a professional electrician without hesitation. Not only will an electrical service be able to diagnose your problem and then provide a solution to correct it, they are able to help prevent it from occurring again. But, you could still be worried over the expenses involved with this approach. To ensure that your operations are running smoothly, the expense of hiring a professional is a small price to pay. However, if you’re still unsure if you need an electrician or when your staff is able to correctly get the task done, keep reading. 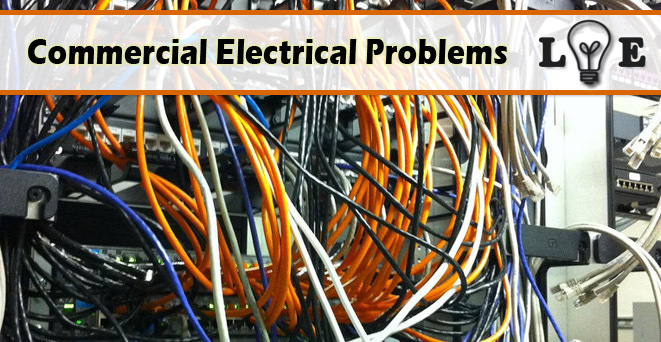 Below are four electrical problems that professional commercial electricians are able to assist with. Any business can suffer from unannounced power loss, which could be damaging to deadlines or production. When things are going great, staff is on track with the daily target, and power suddenly goes out and you’re in the dark, it can be due to various things. Commonly, it may be due to a safety trigger being tripped. Power loss may be to the entire facility, which is a sign that a circuit breaker has been tripped. When power load gets too high for the breaker, it trips a safety trigger that shuts it off. In the majority of cases, flipping the breaker switch should correct the issue. However, if the power does not return or it continues to happen, it is recommended that you contact a professional electrician service. They will come inspect and diagnose the issue, and offer a solution. Although watching sparks fly on the 4th of July is fun, those that come out electrical outlets in the workplace can be scary. Sometimes this occurs when a person plugs in an appliance or machine, or turns something on. This can be caused by the appliance that was plugged in, beginning to draw power that was being used by existing appliances, resulting in sparks. Once the electrons settle, it usually subsides. Although, if it does not subside and you can visually see the electrical wires and outlets melting or burning, turn off the main power source and contact a professional electrician. It can be very dangerous, even deadly to tamper with sparking outlets. In situations where lights begin to flicker around your commercial space, there can be many reasons for this. The most common reason, a poor connection. If the issue is not corrected right away, it can get worse and cause even more damage. In addition, by waiting you risk having a much larger repair bill. Therefore, it is recommended to contact a professional electrician when first noticing the flickering lights. This is also a common residential electrical problem. In a workplace, there is no shortage of heavy appliances, especially in a factory or warehouse environment. This creates the constant risk of a single appliance drawing excessive amounts of power from the main source, causing circuit breakers to trip. When this is an issue, there are a couple options. You turn off other machines when using the equipment using excessive power. Determine how to rectify the issue, and contact commercial electrical service professional. A professional electrician will install another circuit for the specific appliance or machine causing the issue. Otherwise, power will be directed to another breaker, lowering the load on the main circuit breaker to ensure it does not trip in the future. Of course, this is only four common situations that require contacting a commercial electrical service professional. Thus, if you notice any of these issues in the work facility, you should not hesitate to contact a professional. If you experiencing problems that require a commercial electrician Lammon Electric can help. Lammon Electric are commercial electricians in Albany & Troy, NY offering commercial electrical repair and solutions for the most common commercial electrical problems.